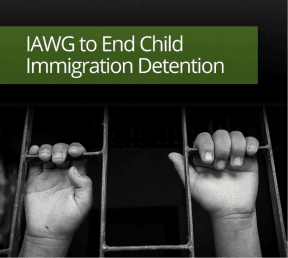 The impact of immigration detention on refugee, asylum seeker and migrant children continued to gain international attention in recent months as a new Inter-Agency Working Group (IAWG) to End Child Immigration Detention was formed following a side event at the UN Human Rights Council in Geneva in June 2014. The inter-agency group is comprised of sixteen prominent UN groups, intergovernmental organizations, and civil society representatives who collectively represent stakeholders in every country of the world. Together, they have committed to a 3-year term of engagement in which they will seek to assist states to “completely and expeditiously” end the practice of child immigration detention, consistent with the UN Convention on the Rights of the Child. This development recognizes that over the past five years, the issue of child immigration detention has risen in importance on the global agenda. UN and civil society partners alike have undertaken significant research and lobbying to demonstrate that immigration detention of children can never be in a child’s best interests. And research increasingly shows that even very limited periods of detention in relatively humane contexts has severe negative, and longterm, impacts on child mental and physical health and development. 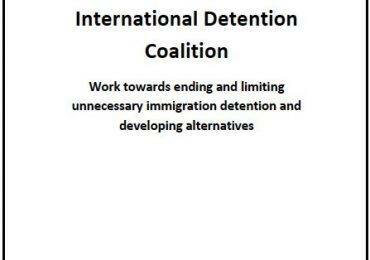 Beginning with the March 2012 session of the UN Human Rights Council, child and migrant rights advocates, with the support of the International Detention Coalition (IDC) and the Office of the UN High Commissioner for Human Rights (OHCHR), launched a Global Campaign to End the Immigration Detention of Children. This campaign has now been endorsed by over 100 organisations in more than 40 countries, and continues to grow. 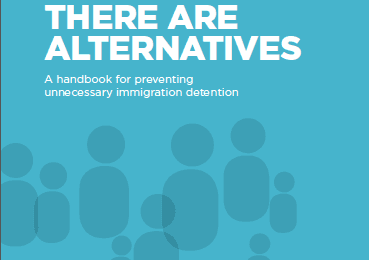 States were therefore called upon to adopt alternatives to detention (ATD) that fulfil the best interests of the child and allow children to remain with their family members and/or guardians in non-custodial, community-based contexts while their immigration status is being resolved. In March 2014, at the UN Human Rights Council, a broad stakeholder group of child rights organizations, migrant groups and longtime supporters of the Global Campaign to End the Immigration Detention of Children hosted a side-event where they explored “A Global Strategy to End Child Immigration Detention.” Immediately following this side-event, groups met and agreed to form an Inter-Agency Working Group to End Child Immigration Detention (IAWG). Terms of reference were developed in the following months and the first official meeting of the IAWG was held in June 2014 on the margins of the UN Human Rights Council. Children are, first and foremost, children and should be treated in full accordance with international law regarding child rights. Liberty is a fundamental human right. Children should never be detained solely based upon their or their parents or guardians’ immigration status. The best interests of the child must be the primary consideration in any action that a State might take in relation to a child. The immigration detention of children always contravenes the principle of the best interests of the child. Unaccompanied or separated children should be appointed an independent guardian. Children and families should be accommodated together in non-custodial, community-based contexts while their immigration status is being resolved. When necessary, states should implement legislation and policies ensuring appropriate community-based placement models exist in practice. Consistent with the principles of family unity, parents or primary care-givers should not be detained, but should be allowed to live in the community setting with their children, while having their status assessed. The IAWG core position is also available here.